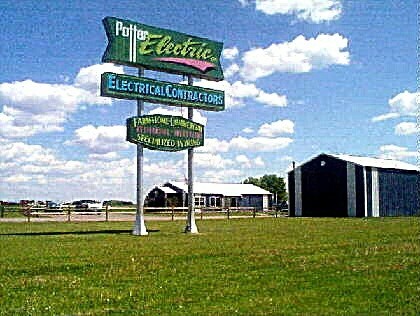 The Potter Electric Co. was started in March of 1969 by Ron Potter a Electrical Contractor and Master Electrician. For the first year of operation it was a one man effort. When it was finally realized that one person could not handle the work load, we expanded by hiring a couple of more employee's in 1970. In 1972 a new shop was constructed at Ron's residence west of Montevideo. In the summer of 1983 we out grew our "NEW" shop and purchased the Menards Lumber property on East Hi-way 7, the same location that we occupy today. We employ at this time thirteen employees and contract work in Minnesota, Iowa, Missouri, Wisconsin, Nebraska, North and South Dakota. Ninety percent of the work Potter Electric Co. does is commercial wiring or industrial wiring. We also do service work throughout the the area we serve as well as farm wiring and residential wiring. We have a very specialized group of people employed and the turn over rate for employees is minimal. Some of our Employees have been with the company for over twenty five years. We are still a expanding Company and always looking for qualified electricians to help us carry on our tradition of excellent workmanship and quality service. If you should happen to know anyone that would fit these qualifications please have them contact us at our E-mail address below.